Note : I received an ARC of this book via Veronica’s blog giveaway. Do check out her lovely blog here. I havent read too many YA books which just have that slight touch of paranormal. The few I have read recently have been disappointing especially a couple of them which are about mind-body-soul because the book somehow ends up reading like religious fiction instead of what was promised in the synopsis. 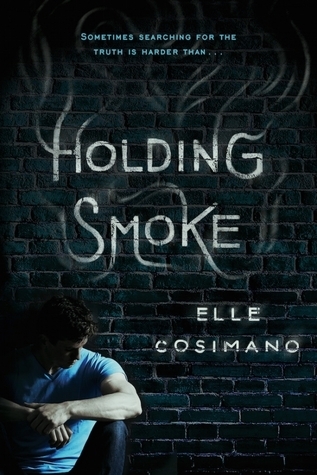 Thankfully, Holding Smoke not just lives up to what is promised in the cover blurb, but also exceeds it by miles. No aspect of the book threatens to eclipse the other – the murder mystery complements beautifully with the human stories of the inmates. That’s a rarity in mystery books with a sizeable secondary cast – where sub-plots often tend to test your patience and make you question their need. But here, you actually do enjoy and empathize with everyone – with all their background stories that have been added cleverly into the book through Conlan’s paranormal power. I loved all the prison scenes, there was no unnecessary amped up melodrama but yet it is so effective – whether it is the counseling sessions or the power play in the yard. I feel like this is probably one of the biggest strengths of the book – to never lose sight of the fact that this is a juvenile rehab and NOT an adult prison. No matter how “hardened” they might be because of the circumstances, their vulnerabilities as teens are always bubbling beneath the surface. I loved how we got the background story of how Conlan ended up in the detention center. The author takes her time to build it up gradually – whether it is the details of the fateful day or nuggets from his earlier difficult years with his abusive father. Conlan’s life is a template of childhood degraded, a present devalued and a future lost – A future that had a college degree and a well-paying job. This is also the story shared by a lot of characters at the center. Of course, if you are lucky you might have an empathetic warden or a counselor taking an interest in you and reinforcing the belief that you can finish your education and making something of your life once you get out. But no inmate seriously believes it. There is no romance in this book. What Conlan and Pink have between them is more of a strained-friendship-with-romantic potential and that’s a good thing because both have a lot of things going on in their individual lives. Pink is practical and gosh – just so gutsy! Not some wannabe badass. Conlan initially seeks her out because he needs her help but later does start valuing her and respecting the life she leads. He also feels like he is losing out on someone important to him when turns her away at one point in the story. Despite his feelings for her, I liked how Conlan never turns reckless in using his paranormal ability just to meet her. There is an epilogue that I felt was not required. I got my closure even without that. Well, with or without the epilogue, it was such a bittersweet conclusion and an immensely satisfying one.